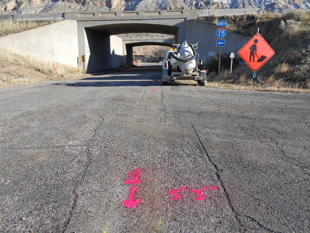 SUE Solutions contracted with UDOT Region Four through the use of its On-Call Contract for the I-15, Truck Climbing Lanes, MP 31.5 to MP 34.0 project located in Washington County, Utah. SUE Solutions was contacted by the project’s design consultant requesting both Quality Level B (designating) and Quality Level A (potholing) SUE, for an existing eight (8) inch high pressure natural gas pipeline. SUE Solutions was able to mobilize crews to the project and complete the work within one week’s time. The project involves the addition of travel lanes along the I-15 corridor, as well as structure modifications to an existing interchange. 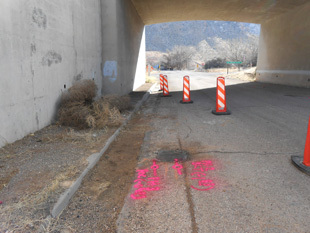 Upon the commencement of the SUE QL-B activities, SUE Solutions was able to identify an existing buried phone line as well as an existing fiber optic duct system that was not originally accounted for within the existing project utility plans. SUE Solutions designated approximately 750 feet of buried utilities and completed three test holes at critical project locations, obtaining vital utility information such as depth, horizontal location, size, and material. SUE Solutions completed the SUE activities ahead of schedule and on budget.